It’s true that oil from BPs Deepwater Horizon fiasco is still sticking to and covering parts of the sea floor for some 80 miles or more around the site of the now-capped well. In early September, researchers from the University of Georgia found oil some two inches thick on the sea floor as far as 80 miles away from the source of the leak, with a layer of dead shrimp and other small animals under it. “I expected to find oil on the sea floor,” Samantha Joye, lead researcher for the University of Georgia’s team of scientists studying the effects of the Deepwater Horizon spill, told reporters. “I didn’t expect to find layers two inches thick. It’s kind of like having a blizzard where the snow comes in and covers everything,” Joye said. But as recently as three months ago the National Oceanic and Atmospheric Administration (NOAA) reported finding no evidence of oil accumulating on the sea floor in the Gulf. NOAA Administrator Jane Lubchenco told reporters then that the oil from the massive spill that never made it to the surface was dispersed naturally or chemically. 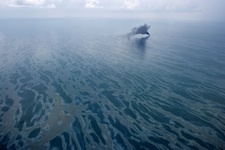 She added that only about a quarter of the 200 million gallons of spilled oil remained in the Gulf, the rest having “disappeared” or been contained or cleaned up. One of the reasons why so much oil may have sunk was because it was broken up into tiny droplets by chemical dispersants, making the oil so small that it wasn’t buoyant enough to rise as would otherwise be expected. Also, as oil still in the water column ages it becomes more tar-like in a process called weathering, and as such becomes more likely to sink. And to make matters worse, oil on the sea floor takes longer to degrade than it would on the surface because of the colder temperatures down deep. The new findings are particularly troubling because of the potential ripple effects the remaining oil could have on the wider ecosystem and industries that rely on a healthy marine environment. Marine biologists and environmentalists worry that the oil is doing significant harm to populations of tube worms, tiny crustaceans and mollusks, single-cell organisms and other underwater life forms that shape the building blocks of the marine food chain.